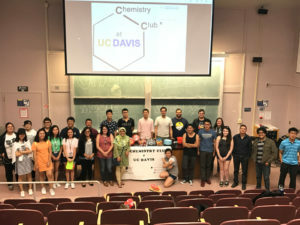 Home » Awards » UCD Chem Club Wins Awards! What is the Chemistry Club up to now? From presentations during orientation to watching Guardians of the Galaxy while bonding with fellow transfer students, your ACS Chemistry Club was busy even before the fall quarter started. Now that school has started once again , we are excited to have you join us and be part of the fun. Perhaps you saw us during the Major Resource Fair or the Fall Open House. Maybe you came to our movie date afterwards. If not, do not wor ry. It’s never too late to come join us at other events! The American Chemical Society recently announced that our Chemistry Club will receive the 2016-17 Outstanding Student Chapter Award . This award, the highest given to a national student chapter, recognizes our community service as well as student outreach programs that have occurred this past academic year. Notes the ACS review committee, “The dedication your chapter has shown to serving a wide range of ages in your university and community is im pressive. You all have a very clear mission statement for your organization. The thought you have put into where you want to spend your time and energy is great. The American Chemical Society recently awarded our student chapter this distinction for successfully performing at least three activities that highlight the value of green chemistry to humans and the environment. In addition to this award, we have been invited to “submit an abstract to present your chapter’s green chemistry activity during the CHED Green Chemistry Student Chapters: Stories of Success session at the ACS National Meeting in New Orleans.” We’re currently working with the Department’s Outreach Committee on possible abstract proposalsChemistry Club @ UC Davis Receives ACS Green Chemistry Student Chapter Award. Nicole Nunez Began in UC Davis like many of us: as an undergraduate. She majored in biochemistry and molecular biology. Eventually she found herself working as a graduate student in the David lab on DNA Repair. Read her interview to learn more about this amazing Aggie. May you summarize your research project briefly? defect of various DNA repair genes can result in the onset of various diseases and cancer . It is really important that we understand how our bodies are naturally able to protect themselves from these damaging agents and what happens when these pathways go wrong. In my research, I focus on an enzyme called MUTYH that is really important in initiating the pathway for correcting DNA damage that happens due to oxidative stress. It scans the DNA, locates the damage and then removes it. If this protein is unable to function properly, it can result in an accumulation of mutations. More specifically, if you inherit a defective form of MUTYH, you are highly predisposed to a type of colorectal cancer called MUTYH associated polyposis. Out of all of the projects in the world, how did u know you wanted this one? I knew I wanted to go into cancer research because I had lost my mom to colon cancer when I was in high school. I made it my life mission to try to understand cancer and how to target cancer in the hopes that one day I could develop curative therapies that could be used to treat cancer patients. I was drawn to Sheila’s lab because it was a great place to learn about how cells become cancerous. May you give us a tiny peek into your Daily life as a graduate student? Definitely . I wake up around 6am and try to get to work by 9am. I begin my morning by answering a bunch of emails and catching up on logistical things. I then try to get some experiments going. I take a lunch break which could just be me quickly shoving food into my mouth in my office or actually being social and getting lunch with colleagues. After lunch, I continue and try to finish my experiments . Sometimes I have meetings sprinkled throughout the day. Typically, I leave home around 6pm. What do you think was the hardest part in your graduate career? Although the beginning of your graduate career is pretty stressful, I think the most stressful and hardest part was the QE (Qualifying Exams) which happen your second year. It is intimidating because it is three hours of you, a chalkboard, and five professors who can ask you anything they like in the field of Chemistry and if you don’t pass, you only get one more chance. If you don’t pass the second time, you get a Masters. So, it is this pretty intense moment in your graduate career that is the ultimate deciding factor of whether you can continue in this field and get your PhD. In your video with Robert, you said it’s a marathon and not a race. How do you balance everything in this marathon so it doesn’t burn and stress you out? I like to think of it in two lights. One is that just because you had failure today does not mean there won’t be success tomorrow. It is important to remember that tomorrow is full of new possibilities even if your experiment failed today or you got a horrible grade on something. I like to think that if you leave lab with just one more thing to try tomorrow, you will always feel like you are moving forward. At the same time, it is important to balance yourself. There has to be some structure to your day. Work hard but incorporate things that are for your happiness. Have different hobbies. Maintain some kind of social life. It can be very isolating working in a lab with only your bacteria . Doing these things will help you remember that this is a journey and not a quick race to some finish line. What fun stuff do you do when you are not trying to save the world from cancer? I am into art — so I paint, scrapbook, knit, and sew. I am trying to learn to play the piano right now — maybe play a song by the end of this year. I also enjoy snowboarding and hiking. I am trying to learn how to incorporate these hobbies a little bit into my day as I transition from graduate school to working. You were one of the first people in your immediate family to go to college. What was some of the challenges you faced? I heard you are married. How do you manage to balance your marriage life with a working life? You just need a really supportive partner. It’s really important to make time for us as much as possible. I think we have a lot of little things that helps too like I make breakfast for him everyday. I feel like that is a nice thing I do for him everyday. He loves it and I actually eat breakfast. I think it’s important to make time for that person in little ways everyday and it will make it so that they will be able to tough it out with you through grad school. 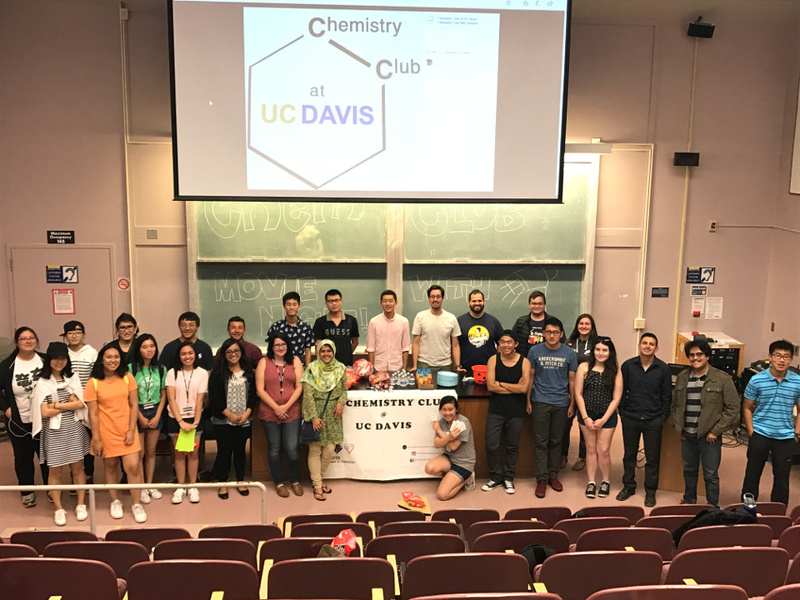 The UC Davis Chemistry Club organizes and participates in a wide variety of activities including the well known Chemistry Magic Show on Picnic Day.